Who ever thought winter time was a time to slow down and relax certainly didn’t have a camera in their hands. Winter time can be an amazing time to go out and experience the nuances of nature. Cool clear nights, frosty mornings with snow covered fields and forests the subject matter is endless. And we haven’t even started on the wildlife. 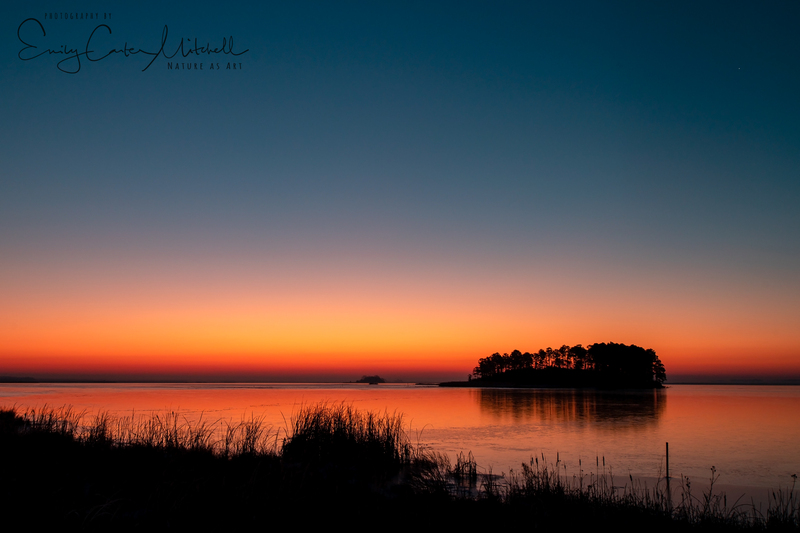 This morning I left at o-dark-thirty to arrive at Blackwater National Wildlife Refuge in Maryland’s Eastern Shore which covers over 28,000 acres of tidal marsh, mixed forests, and managed croplands. Even though the government is currently going through a shutdown, the wildlife loop has been open. But due to the snow we received this past weekend the wildlife loop has been shut down as no one is on staff to plow the road. However that is no discouragement to me as the Wildlife loop is only a small part of the expansive wildlife refuge. Dawn was briefly colorful before the sun began to rise over the horizon and the discoveries were found elsewhere. One should always look the opposite direction from the sunrise to see how the color is reflected in the landscapes. Beautiful pastels painted the landscape and the vegetation was covered in frost. 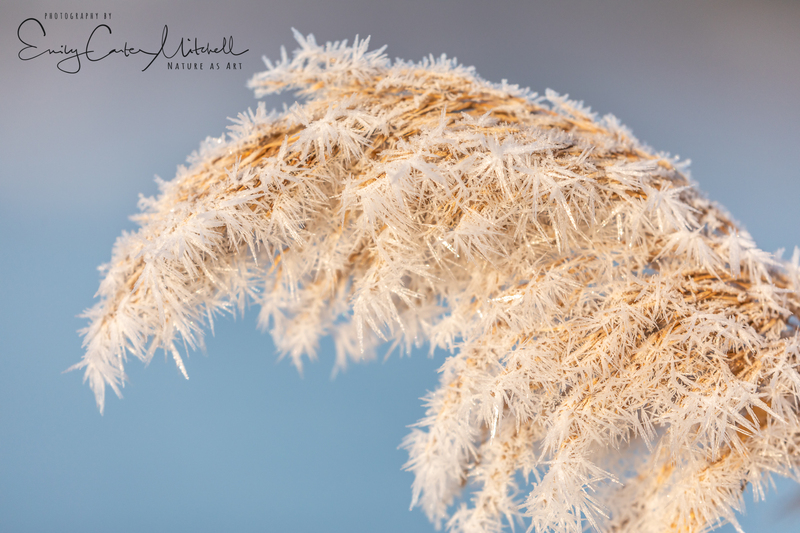 It was a unique morning with weather conditions as the temperatures were below freezing which lead to Hoar Frost on the leaves and grasses. Sharp with their edges and geometric I lamented the fact that I had left my macro lens at home. Having everything else in the car, I pulled out the 100-400mm lens and used that for some close up photography. The adventure continued and we traveled down the road heading to the next stop. But then we turned the corner and gasped. 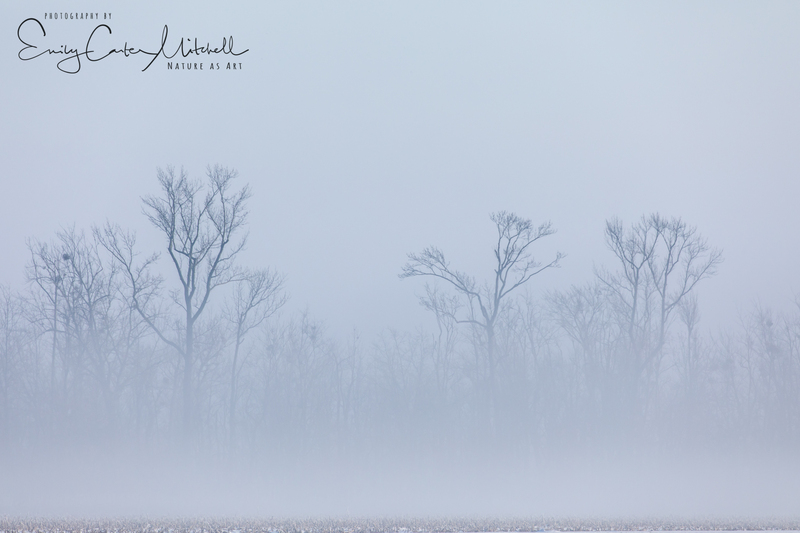 The snowy field was covered in fog. Magical….mystical. Gotta stop and capture it. So glorious was the fog and then turning around we gasped once more. 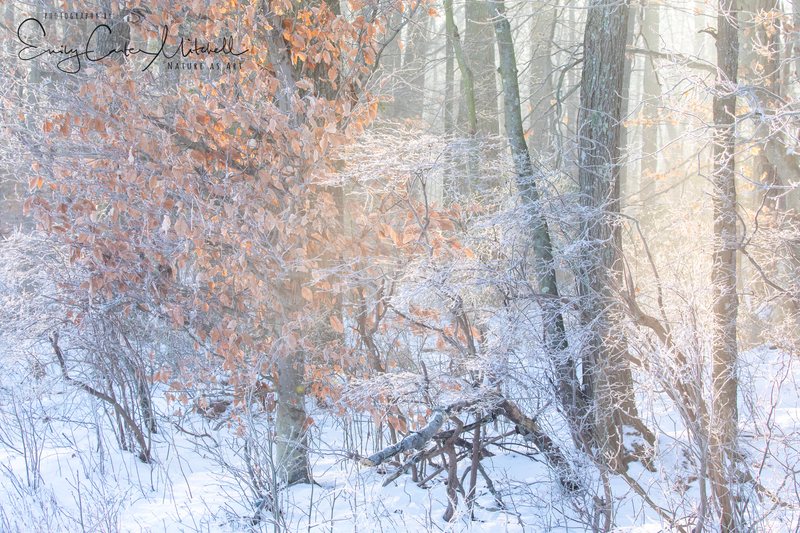 The sun shined through the frost covered forest with the fog illuminating and reflecting the light. Truly nature is magic. Both of these images are straight out of camera with only minor Lightroom adjustments for contrast, etc. And when you think we might have run out of material to work with there was so much more. Marsh grasses along the road and even better the unique variety of ice formations and crystals when we looked closer. It was a wonderful outing and I’m looking forward to offering future photography workshops at Blackwater in the near future. Each time I visit it’s completely different than the time before. You may never know what you may see, but it is always wonderful for the inquisitive explorer. Nature never ceases to amaze me. Thank you. Truly magical – so lovely! You are so kind Eliza and hope all is well with you. Thank you! Yes, thank you! Enjoying the downtime of winter. Stunning pictures, thank you very much! Truly my pleasure. Happy you enjoyed them Ganz. Living in Alberta where winters are very cold and very long I have found if one only braves the elements and heads out into Nature there are some truly wonderful and unforgettable experiences waiting for you.